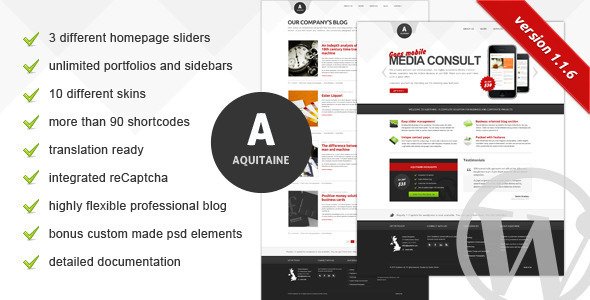 Aquitaine is a powerful and very flexible wordpress theme with a strong business / corporate feel, even though it can be used to pretty much anything. You can easily choose between multiple portfolio types to beautifully illustrate your work and make a great use of professional blog section that comes with this theme. On top of that, you can choose between 3 different homepage layouts, services, our team, testimonial sections and also play with a great number of shortcodes for content management.